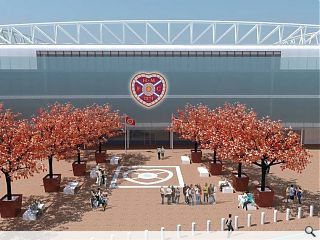 Hearts Football Club has secured consent from the City of Edinburgh Council to rebuild the main stand at Tynecastle Stadium. The £11m project will see the historic 1919 structure remodelled to increase capacity from 4,720 at present to 7,200 – achieved by demolishing a large amount of the current stand including ticket offices, shops and nursery. Current ground floor facilities will be refurbished as part of the works contract overseen by James Clydesdale and Associates. Work on the expansion will now get underway later this month for completion by September 2017. The superstructure of the new stand will be build around the old and where existing buildings have been cleared. Much of the corporate and offices can be built outside the current footprint. The old stand will then be removed in its entirety. There is still a funding shortfall that is being addressed.